Check out our Q&A below and if you still have questions please visit our contact page, fill out the form and we will get back to you as soon as possible. Make sure to visit our Tips & Techniques, Tutorial, and Inspiration pages, as they are great resources as well. What is Chalk Synthesis Paint? What surfaces can I paint with Wise Owl? Do I ever have to sand or prime before painting? What type of brush is the best to use? How do I care for My Cling On! Paint Brush? What do I clean my piece with prior to painting? Can I paint my kitchen cabinets with Wise Owl Chalk Synthesis Paint? Why am I seeing discoloration on my painted piece? How do I apply the paint? How do I create a distressed look? Do I have to seal my piece? If so, which is the best sealer? Q: What is Chalk Synthesis Paint? A: Wise Owl Chalk Synthesis Paint is furniture paint and more. It has superior adhesion to many surfaces including wood and painted surfaces. No sanding or priming is required before beginning most projects. It has a desirable matte finish and is a versatile paint capable of producing many custom finishes. Q: What surfaces can I paint with Wise Owl? A: Bare wood, surfaces coated with varnish, painted furniture, glass, metal, leather, and even fabric and upholstery. Q: Do I ever have to sand or prime before painting? A: Sanding is rarely required before beginning a project. The exceptions to this rule are: removing loose paint from a surface, smoothing out any defects or imperfections you do not wish to keep, and removing rust and debris that remains on the surface. Lightly sanding your painted piece with fine grit sandpaper or a sanding block can produce a smooth surface for easier application of glaze, poly, wax, or hemp oil. After the paint is dry, if a more textured paint finish is desired skip the sanding and go right to choosing a sealant. The superior coverage of Wise Owl Chalk Synthesis Paint will smooth out most minor imperfections. Some laminate furniture may benefit for a light sanding to ensure proper adhesion. Q: What type of brush is the best to use? A: The best brush for the smoothest brush-stroke free finish is a Cling On. Nothing compares to their quality. A natural bristle brush produces subtle texture and makes painting quicker and easier. A stiff natural bristle brush is able to get into detailed pieces with ease. They are also great to use for wax application. Synthetic and sponge brushes and rollers may be used for different finishes. Find what brush works for you. Q: How do I care for My Cling On! Paint Brush? A: Cling On! paint brushes are designed to be stored and used wet. Suspend the bristle tips in water by attaching a clip to the handle and storing in a jar with a little water. After use, return to the jar and the paint will just slide off and will simply need a slight rinse before the next use. Squeeze out a little water from the brush and you are ready to paint. This extends the life of the brush and helps preserve shape retention as well as produces a smooth brush stroke free finish. The string attached to the round and oval style brushes is meant to stay in place to help the brush hold its shape. Should you allow paint to dry on the brush accidentally, soap and water cleanup is acceptable. Q: What do I clean my piece with prior to painting? A: Cleaning your piece of surface debris and oils is extremely important. To ensure proper adhesion, clean with a vinegar and water mix, which will also help neutralize any odors. De-glosser or Tri Sodium Phosphate may be required before painting kitchen cabinets to ensure any oil residue is removed. Any oil remnants on a surface (including furniture polish) can compromise the adhesion qualities of the paint. Never clean with an oil based soap or degreaser. Q: Can I paint my kitchen cabinets with Wise Owl Chalk Synthesis Paint? A: ABSOLUTELY! Many kitchens have been given gorgeous makeovers with Wise Owl Chalk Synthesis Paint! As long as you clean the surfaces properly and seal with an appropriate sealer, your cabinets will maintain a beautiful and strong finish. We recommend Wise Owl Matte or our Satin Varnish for the strongest finish. Q: Why am I seeing discoloration on my painted piece? A: There are times when a barrier may be necessary. Some furniture may have stains and varnishes and tannins present in the wood that may bleed through. This generally shows itself when the topcoat is applied and draws the stains to the surface. If you experience this, you can apply our Matte Varnish or any brand of shellac under the paint to block bleed through. Primer is not generally effective at preventing bleed though due to its porous nature. Pieces from the depression era may have such finishes that require a barrier to ensure it doesn’t change your finish to yellow or pink in areas. If you have already painted and are noticing bleed through, the basecoat may be applied over the dried paint. After the barrier is dry you may paint right over it. Some wood species such as pine, oak, and mahogany may occasionally discolor paint from tannins in the knots in the wood. The same technique of applying a barrier will eliminate this from happening. Q: How do I apply the paint? A: There are many techniques for applying the paint. To start, make sure you thoroughly shake and stir the paint. Shake the can vigorously for one minute then open and stir. You may pour the paint into a smaller container to keep the can clean from paint or you may paint directly from the can. Dip only the first 1/4’” of the brush into the paint and paint in short brush strokes in a thin coat to reduce brush stroke marks. It may be applied in a crisscross pattern as well if more texture is desired. After your first coat is thoroughly dry you may apply a second coat if needed. Sanding between coats is not necessary. Q: What is dry brushing? A: Dry brushing is a technique designed to mimic an antique weathered or distressed look or to layer several colors into a finish with lots of dimension. To achieve this look, simply dip the very end of your dry brush into the paint. Gently wisp on the paint without covering all areas. You may paint in all directions or stay horizontal or vertical depending on the desired look. This technique is especially effective on pieces with lots of texture or detail. Allowing the paint to just graze the raised detail adds character and detail to your piece. You will use less paint and further distressing is not required. Q: How do I create a distressed look? A: There are several techniques to achieve a layered, chippy, distressed, or aged look. After your paint is dry you may lightly sand with sandpaper or a sanding block to reveal the finish below the paint. Focus on areas that would be distressed with time. You are trying to mimic what time would naturally do to a piece. Focus on areas of detail and the edges and legs of the piece for a natural distressed look. Layering paint colors and sanding to reveal colors below is a technique which produces unique pieces. Dark wax, glazes, and even stain may be applied to add patina and character to pieces. School glue can even be applied and painted over to create a chippy or crackle effect. Paint may be applied in thick coats and hit lightly with a hair dryer for a crackle effect. Get creative with your techniques! Q: Do I have to seal my piece? If so, which is the best sealer? A: Yes, Wise Owl Chalk Synthesis Paint is a porous paint. All of the negative pore space enables the paint to have superior adhesion qualities. The pore space must be filled or protected to reduce further distressing and to prevent the paint from absorbing liquids or oils from use. Choosing the right sealant depends on the piece and its intended finish and use. 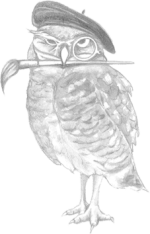 Wise Owl Furniture wax is a solvent free natural wax. It is very easy to apply and preserves the desirable matte finish of the paint. Wise Owl Furniture Wax comes in many colors and can be layered for effect. Clear wax will not change the paint except to richen the color back to its original color after sanding. Wax will need to be reapplied every now and then depending on the use of the piece. Wax is not recommended for pieces such as kitchen cabinets and tabletops. Surfaces with heavy wear may need further protection such as our Matte Varnish topcoat. Wax is not intended for outdoor use. It cannot withstand rain and heat. Always remember, if you use wax, it should always be the last step. You should not try to apply our Matte Varnish over wax. The barrier properties of the wax will keep the finish from properly adhering. If you desire to paint over or refinish a waxed surface, clean well to remove residual oils and then reapply your finish. IS A NATURAL SEALANT - May be used in place of FURNITURE WAX over painted pieces. It is much softer and easier to apply than wax due to its high hemp seed oil content. It provides a strong finish due to the beeswax, carnauba wax, candelilla wax, hemp seed oil and coconut oil formula. WILL REVIVE, SOFTEN AND PROTECT leather (you can even use it to add water-resistance to your boots!). REMOVES OXIDATION from tarnished metal and hardware. Simply apply and wipe away years of patina and grime. WILL NEUTRALIZED ODORS, use inside drawers to seal and protect while removing unwanted smells from furniture. IS WATER RESISTANT- provides protection against water rings and moisture. It may also be used to remove existing water rings. Makes an excellent HAND AND NAIL TREATMENT! Our natural formula is so safe and we know you will adore softening and moisturizing your hands while using it! OFFERS AROMATHERAPY- enjoy the calming scent of lemon verbena while rejoicing in the skin improving qualities of cold pressed lavender oil. KNOWN AS AN ANTISEPTIC, ANTI-FUNGAL, ANTI-PARASITIC AND BACTERICIDAL PROPERTIES- protects against mildew, mites, parasites and pathogens and even repels insects! Who needs moth balls when our Furniture Salve smells like a day at the spa! We all know some of the best furniture finds come from the roadside, and we don’t always know where they have been! HEMP SEED OIL FORMULA -Contains all of the scientifically packed powers of this all natural super oil. Our salve will add a soft sheen to your projects. If you love using hemp seed oil alone, but wish it had more of a shine, then this product is for you. It also provides more water protection than hemp seed oil alone. SUBLIME, SOFT, and STRONG formula that is easy to apply and goes a LONG way! To Use simply apply our Furniture Salve with a lint free cloth or a natural bristle brush and work into surface then buff well with a lint free cloth. Apply as needed to revive and protect. May be used over raw wood, finished or stain wood, painted furniture, and even metal to remove tarnish. Glaze can produce a very strong finish and a coat of our Varnish may be applied over it if it will be exposed to heavy use. If you choose to glaze your piece, hemp oil is not a suitable candidate for an additional sealant because it is not able to penetrate through the glaze. It may still be used to add shine. Wise Owl glazes may be layered for different effects but need to dry thoroughly before applying another coat or color. Hemp oil is 100% natural oil that is a superior sealant. It will leave a buttery smooth finish on your paint if the wet sanding technique is employed. Hemp oil is especially great for pieces with heavy distressing because it penetrates through all layers of the paint and can richen and protect any of the original wood showing through a piece. Hemp oil fully cures to a hard and strong finish within 30 days. It doesn’t generally need to be reapplied because it doesn’t just sit on top of the paint like other sealants. A light wipe down with more hemp oil on a sponge or lint free cloth can bring life back to a piece if needed. Hemp oil may be used on any wood surface. Hemp oil is able to penetrate the surface of raw or stained wood. If you are using hemp oil on wood that is varnished, the hemp oil cannot be absorbed because of the barrier but can still produce a gorgeous shine. We are so excited to offer a solution to your topcoat troubles. Our Varnish is unlike any other water-based topcoat. Our varnish formula is truly revolutionary. We utilize a crystal-clear resin to yield serious protection that will not yellow or discolor whites due to the crystal clear technology. Our Varnish provides industrial grade strength suitable for cabinets and high traffic areas. This finish is best suited for heavy traffic areas or outdoor use. Most cabinet applications require a durable topcoat because of their heavy use and our Varnish can withstand heavy wear and tear. Many topcoats can yellow over time so using our Matte Varnish will ensure you will not have yellowing or discoloring. You may apply our Varnish over dried paint with a Cling On flat brush for the smoothest finish. Our matte finish will preserve the flat finish of the paint but you may choose our Satin Varnish if more luster is desired. Drop us a line or give us a ring! We love to hear about your projects, experiences, and are happy to answer any questions.